The spirit of Wild Turkey has been captured in this barrel proof whiskey to create the finest of bourbon pleasures. Hand-crafted and uncut with water, Rare Breed is truly a legendary treasure to savor. 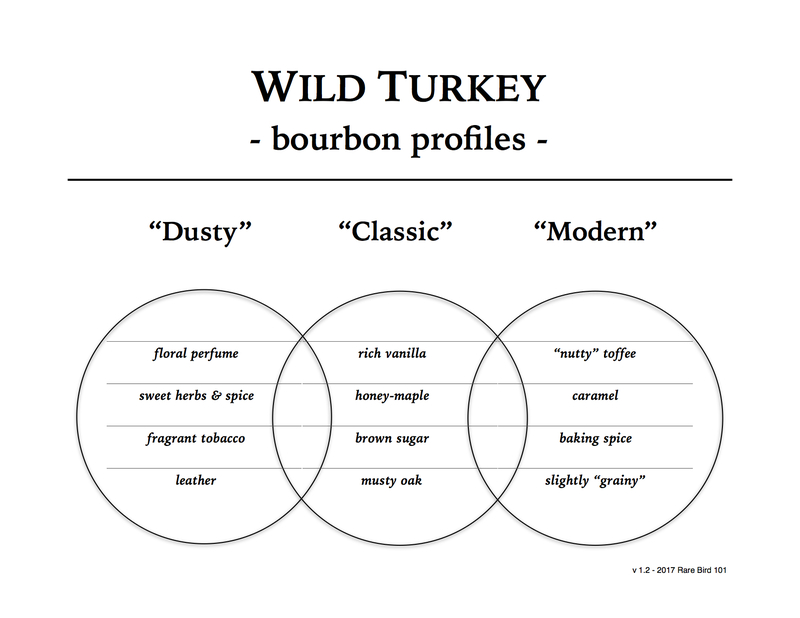 Of all the Wild Turkey whiskeys, I believe Rare Breed is the one suffering from the greatest fog of uncertainty. First, what is it? The story is it’s a blend of six, eight, and twelve year straight bourbons. Well, if it’s not on the label then that can’t be guaranteed. Second, if it’s uncut with water as the label states, then how for at least a decade (batch WT-03RB ran from the early 2000’s until 2014) has the total barrel proof for the batch (which could be dozens, or dozens of dozens of barrels) always equaled exactly 108.2? And let’s say you kept adding the necessary strength barrels to make the math work every batch – would you not be sacrificing profile for numbers? I’m honestly not trying to be negative, I just think Rare Breed is a Wild Turkey product in need of an overhaul (and unfortunately, that didn’t happen with the 2014/2015 release, Rare Breed 112.8). Sigh. Overall: I know it seemed my review was headed in a critical direction, but while I think this product line could be better in so many ways, Rare Breed Batch WT-03RB is a very good whiskey. And I should probably be more specific here – WT-03RB is to-date the last of the good Rare Breed batches. At least in my opinion, WT-03RB has a profile that fits a six, eight, and twelve year old blend. It has the honey, spice, and leather reminiscent of an export 12-year WT 101 from the same time period (mid-late 2000’s). It also has a fair amount of vanilla and toffee that I’d associate with a 6/8-year Wild Turkey 101, as well as a similar mouthfeel. The only thing I really don’t like about this Rare Breed batch is a sharp bitterness – primarily on the palate. Going back to the nose, it’s more clove-like in nature and non-offensive. When tasting, however, the bitter note really makes itself known and becomes somewhat distracting. While it certainly doesn’t ruin the whiskey, the bitterness does create a notable imbalance. All in all, this is an enjoyable barrel proof Wild Turkey bourbon if purchased at retail price (definitely nothing to pay a premium for).